This statement became one of the cornerstones of a theological stream that has a history of well over a century; it became more pronounced in the 1950s and 60s and continues to have a large following among today’s Seventh-day Adventists. This theological current is known as Last Generation Theology, commonly abbreviated as LGT. Its supporters believe that Christ will not return until there is a group of believers who have reached perfection. Jesus, they say, had the same human nature as Adam had, after his “fall” into sin, and as we have today. Since He was exactly like us and did not sin, this is a state we can also reach. The cross of Christ did not complete the atonement, but the victory over sin by the “last generation” is the final phase of the atonement, when God will be vindicated and Satan is totally defeated. This Last Generation Theology has not gone unchallenged by theologians and church leaders in past decades, but it seems that presently the dangers of this alternative theology are evoking stronger reactions from different quarters than we have seen so far. Two books on the topic have recently been published, and one more is on the way. 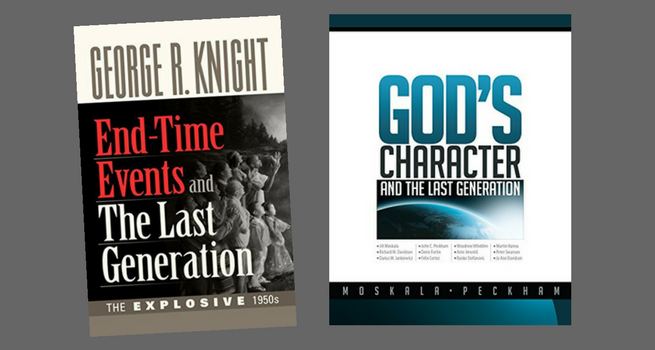 The Pacific Press has published a book by George Knight, a prolific author and one of Adventism’s foremost historians, entitled: End-Time Events and the Last Generation. The same publishing house has also just released a book by fourteen theologians who teach at Andrews University. This work carries the title God’s Character and the Last Generation. Thirdly, Oak and Acorn Publishing will before too long add a third publication on the very same topic, written by the author of this article, which will be called In All Humility: Saying NO to Last Generation Theology. Professor George Knight’s book is relatively short with just 129 pages, but it provides an excellent overview of the various aspects of Last Generation Theology. Knight, as always, writes with passion. And, as do several of his other books, this one also reflects his own personal history. After becoming an Adventist, he desperately tried to be perfect and became a firm believer in LGT. But after some years he vigorously rejected this approach to his Adventist faith. Knight gives a succinct but clear description of the historical background of LGT, with a focus on the person and ideas of M.L. Andreasen, one of Adventism’s most influential theologians in the mid-20th century. However, Knight also described the earlier phase of LGT thinking and the post-Andreasen developments—in particular the controversy around the book Seventh-day Adventists Answer Questions on Doctrine. The subtitle of Knight’s book, The Explosive 1950s, underlines his conviction that several of the current theological challenges of the Adventist Church have their roots in the “explosive” 1950s. He deals with the most significant aspects of LGT, but tells the reader his treatment is far from exhaustive. Nonetheless, it gives a good overview. I found his conclusion quite convincing that most of the theological turmoil in Adventist history—in which LGT plays an important role—is the underlying unceasing tension between those who want to stress the similarities between Adventism and traditional Christianity on the one hand, and those who believe the unique features of Adventism must receive primary attention on the other hand. As expected, there is a fair amount of overlap between Knight’s book and the much more expansive treatment of Last Generation Theology by the Andrews University scholars. The former is well documented, but the Andrews’ scholars’ book is even more heavily footnoted. This feature, and the in-depth treatment of most of the relevant issues gives the book a more academic flavor than Knight’s volume has. The books also differ in tone: Knight is much more combative than the Andrews group, which, we are told, does not want to be polemic, “but aims to provide a positive, constructive approach to the issues concerned with LGT” (13). The earlier chapters cover subtopics such as the scope of the “great controversy,” the nature of sin, justification and sanctification. Later chapters focus on Christ as our Savior and our Example, the significance of the cross and the role and meaning of the atonement. The authors point to the weaknesses and errors of LGT in all these areas. They lay stress on the inadequate LGT view of human sinfulness and on the faulty concept that Christ’s death on the cross did not mean the final victory of Christ over Satan and the final vindication of God’s character before the universe. They leave no doubt that the LGT concept of a last-day perfect elite, that must play a decisive role in the ultimate vindication of God, is a serious heresy that places a dangerous emphasis on the human contribution to the plan of salvation and “downgrades and reduces the meaning and efficacy of Christ’s death on the cross” (207). The chapters by Jo Ann Davidson about the so-called “delay” in Christ’s Second Coming and that of Ranko Stefanovic on the identity of the last generation are quite insightful. I found, however, two other chapters especially worthwhile, and each of them would, I believe, merit to be expanded into a book-length publication. Ante Jeronicic, in his chapter on Apocalyptic Identity and Last Generation Lifestyle, suggests that the Adventist movement is in danger of “becoming progressively unapocalyptic” in its thinking and in its lifestyle, and as a result the church is threatened with being “drained of its vitality” (133). He argues that the Christian message must retain an apocalyptic framework, which is more than a preoccupation with final events. This serves as a lens through which we see things. The problem is that some get a distorted picture by using a different lens, as is the case with the LGT supporters who accentuate particular aspects while totally muting other elements. Peter Swanson’s chapter is also a most important contribution which even by itself would make this book worth purchasing. It is entitled: Inside the Mind of a Struggling Saint: the Psychology of Perception. Swanson zooms in on the question of how a person can know whether he/she has reached perfection; on the obsessive behavior that may be associated with the quest for perfection, and on the dangers of a “pathological perfectionism” that results from “unrealistic, self-imposed or externally prescribed expectations” (148). In the final chapter an important point is once more clearly enunciated: “The role of humans in the cosmic drama is not to add anything to God’s victory, but is a missional role of proclamation and witnessing to the truth of God’s unimpeachable character and law of love” (278). When I wrote my contribution to the LGT debate I was not aware of the preparations of the two books I briefly reviewed above. When I began to read the manuscript files I was somewhat worried that my book would be rather superfluous. However, after carefully comparing the content of the three books, I think I can truthfully claim that what I wrote adds a few important dimensions to the discussion. If Knight’s book is rather polemic, and the book of the Andrews scholars is more of an academic nature, my book may be characterized as more pastoral. The title indicates that, like the other writers, I respond with an unequivocal “no” to the claims of Last Generations Theology. But the title also includes a term that forms the basis of my approach: humility. It seems to me that a major problem with the supporters of LGT is that they claim to know far too much. They are not modest enough to realize that, this side of the Second Coming, there are lots of things that will remain unknown. There are mysteries that human minds cannot fully fathom. One of these mysteries is that of the human nature of Christ. It is one of the central tenets of LGT that Christ was exactly like we are. Indeed, in Christ God became man, but He did so in a manner that is totally unique and beyond our human comprehension. My book devotes a chapter to the so-called “shaking” that according to many LGT supporters will eliminate large numbers of church members, who do not belong to the end-time elite of “true” Christ-like believers. Like the other two books In All Humility outlines the history of Last Generation Theology and the various key issues involved, but I focus more than these on the dangers of legalism that are never far away when people believe they can become perfect. And my book places special emphasis on how we may experience God’s work of grace in us. The fact that almost simultaneously three books are published that warn against Last Generation Theology is a telling sign that a major segment of the church is beginning to see, perhaps more clearly than in the recent past, that LGT undermines some of the very foundational gospel truths and leads Adventist Christians in a sectarian and legalistic direction in which the role of the “true” believers is accentuated at the expense of the unique work of our Lord Jesus Christ! George R. Knight, End-Time Events and the Last Generation: the Explosive 1950s (Nampa, ID: Pacific Press Publishing Association, 2018). Jiri Moskala and John C. Peckham, eds., God’s Character and the Last Generation (Nampa, ID: Pacific Press Publishing Association, 2018). Reinder Bruinsma, In All Humility: Saying No to Last Generation Theology. (Westlake Village, CA: Oak and Acorn Publishing, 2018). Reinder Bruinsma is a native of the Netherlands who retired in 2007 after a long career in pastoral, editorial, teaching, and church leadership assignments in Europe, the United States, and West Africa. After receiving a bachelor’s degree from Newbold College and a master’s degree from Andrews University, he earned a bachelor of divinity with honors and a doctorate in church history from the University of London. He recently interrupted his retirement to serve as the president of the Seventh-day Adventist Church in Belgium and Luxemburg. He has authored more than twenty books, in Dutch and English, and a large number of articles. He has also translated various theological books from Dutch into English. Images courtesy of Pacific Press.